Representative pretreatment and post-treatment histologic and ultrastructural findings in C3 glomerulpathy. (A) Renal biopsies from patient DDD1 show segmental endocapillary proliferation and leukocyte infiltration on a base of mesangial proliferation and sclerosis in the pretreatment biopsy (periodic acid–Schiff). (B) After treatment, there is resolution of the active features of endocapillary proliferation and leukocyte exudation, but with persistent mesangial proliferation (periodic acid–Schiff). (C) Patient C3GN1, by contrast, has persistent membranoproliferative features with large subendothelial deposits post-treatment (Jones methenamine silver). (D) Patient DDD1 exhibits a mild decrease in the electron density of the intramembranous deposits post-treatment (electron micrograph). Original magnification, ×600 in A through C; ×10,000 in D.
A representative panel of serial sections from patient C3GN3 illustrates the evolution of staining for C3, C5b-9, IgG, κ light chain, and λ light chain in pretreatment and post-treatment biopsies. 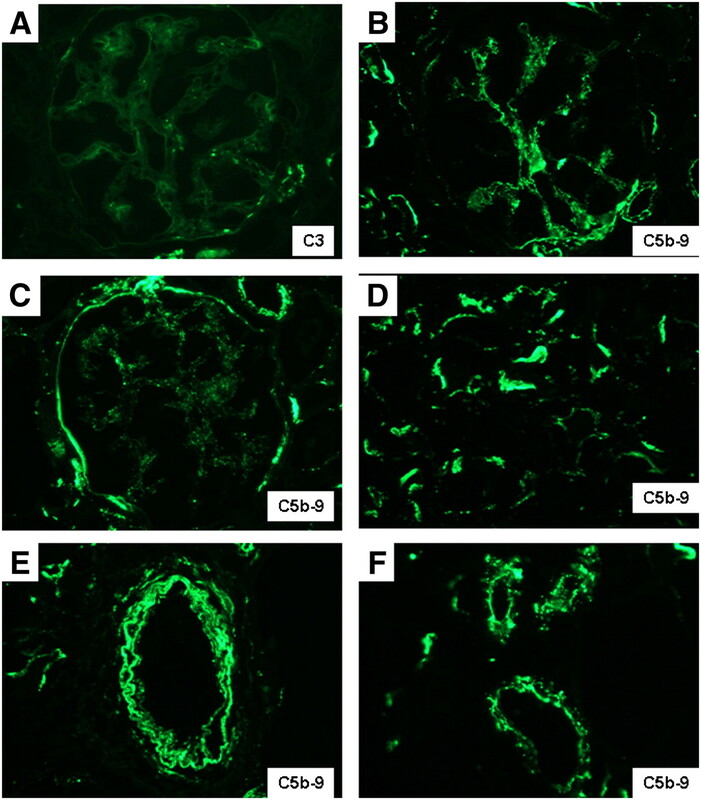 Column 1 shows pretreatment findings in a low-power (×200) view of three glomeruli and an interlobular artery, which demonstrate positivity for C3 and C5b-9, but no staining for IgG or either light chain. Columns 2 (×400; glomerulus) and 3 (×600; tubules) illustrate post-treatment biopsy findings, with the persistence of C3 and C5b-9 in glomerular tufts, Bowman’s capsules, and TBMs, as well as the new appearance of positivity for IgG and κ (with negative λ) in the same distribution. Immunofluorescence staining in serial sections for the IgG subtypes in the post-treatment biopsy of patient DDD1 shown for glomeruli (×600; column 1) and tubules (×400; column 2) reveals positivity for IgG2 and IgG4, with negativity for IgG1 and IgG3 in the distribution of the IgG-κ deposits. Similar results were seen in all of the post-treatment biopsies examined. 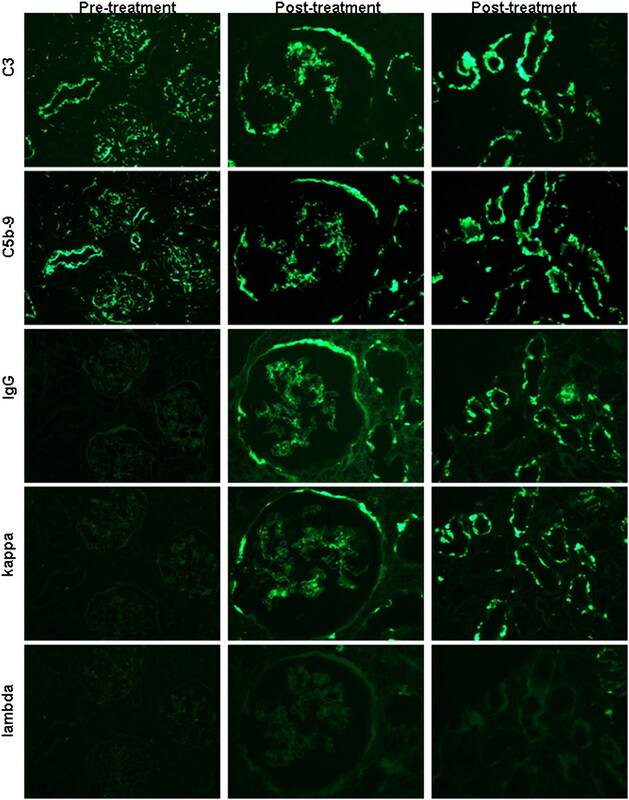 Representative images of the post-treatment biopsy from patient C3GN1 illustrate strong glomerular staining for IgG and κ light chain, with negativity for λ light chain (column 1; ×600). By electron microscopy, the electron dense subendothelial deposits exhibited an unusual punctate highly electron dense powdery texture, resembling those seen in MIDD. This transformation in the appearance of the deposits post-therapy may represent binding of eculizumab to existing deposits. Original magnification, ×15,000 in A; 40,000 in B. Representative distribution of C5b-9 in normal human renal biopsies is illustrated. 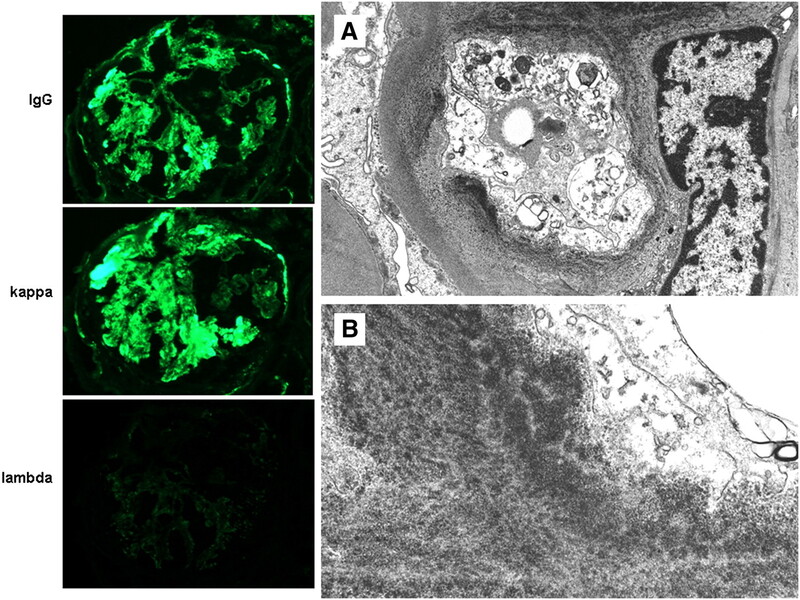 (A) In contrast to the weak and sparse mesangial staining for C3, (B) the identical field stained for C5b-9 reveals stronger mesangial positivity, in addition to staining of the preglomerular arteriolar wall. Focal staining of (C) Bowman’s capsule and (D) TBMs and diffuse staining of (E) arterial walls and (F) arteriolar walls are also observed. Original magnification, ×600 in A through C and F; 400 in D and E.
Structural features of eculizumab. Adapted from Rother et.al.15 Constant regions CH2 and CH3 from IgG4 are fused to the IgG2 hinge region and CH1 domain and then paired with a κ light chain. The variable regions of the light and heavy chains are composed of the murine-derived sequences that have high affinity for C5, admixed with human germline framework regions. The result is a hybrid Ig with high affinity for C5 but without the ability to activate complement or bind Fc receptors. Post-treatment biopsies show evidence of eculizumab binding to glomeruli, TBMs, and vessel walls in the form of immunofluorescence staining for IgG2, IgG4, and κ light chain, with negative staining for IgG1, IgG3, and λ light chain. M, mesangial; M/ECP, mesangial and endocapillary proliferative GN; MP, mesangial proliferative GN; MPGN, membranoproliferative GN. The staining intensity was graded on a scale from 0 to 3+. G, global; M, mesangial; CW, glomerular capillary wall; BC, Bowman's capsule; S, segmental; neg, negative; N/A, not applicable. ↵a Some of these deposits had a distinctly punctate, finely granular appearance, different from the deposits seen in the pretreatment biopsies. These granular deposits may represent deposition of the mAb, eculizumab.